Continuing their exploration of subversion in the museum, Marabou looks to performance artist James Luna. In 1987, Luna laid down in a vitrine at the Museum of Man in San Diego. He wore just a loin cloth and was surrounded by objects including divorce papers, records, photos, and his college degree. Museum labels explained aspects of Luna’s body, such as scars, and the surrounding objects. A number of people touched him, disobeying the almost universal museum rule: do not touch. From time to time, Luna would stretch or yawn, disrupting the visitor’s expectations and objectifying gaze. This performance came to be known as “Artifact Piece.” Luna was commenting on the standard museum practices of presenting indigenous cultures as natural history (objectifying instead of humanizing, presenting difference as curiosity) and of the past (implying indigenous people and cultures no longer exist). Luna was a living and breathing human in the exhibit, challenging the idea that native people are extinct. 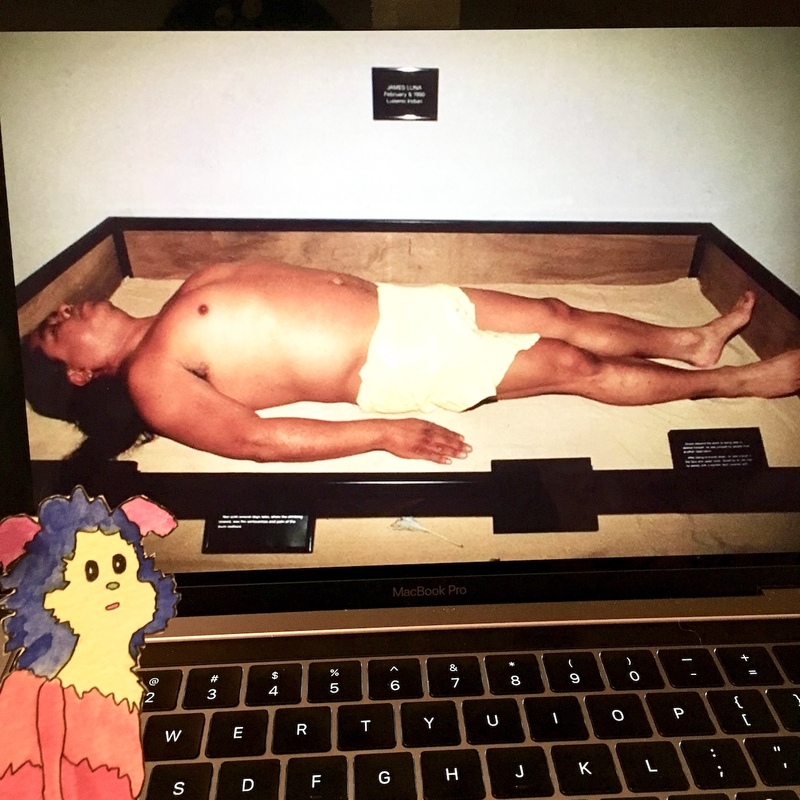 The objects surrounding him explained that “a modern Indian” likes music, went to school, and keeps photos of family and friends, just like the gawking museum visitor.